"The Lincoln School on Crescent Street was built in 1892 and was one of four schools built from 1883 to 1902. The Town Report of the year ending January 31, 1893, stated that 'according to Section 46 of Chapter 43 of the Constitution of the State, every town not divided into school districts shall provide and maintain a sufficient number of school houses, properly finished and conveniently located for the accommodation of all children therein entitled to attend the public schools.' Section 4 of Chapter 46 added that 'every child must be in school for at least 20 weeks of the year, from the time he is 8 until he reaches the age of 14.' When the Lincoln School opened at the beginning of the 1892-1893 school year, several changes were made to the 'Centre' schools: the Centre First Grammar School was transferrred from the third story of the high school building (it was determined that the third floor was not a suitable place for young children), and the Hamilton First Grammar School students moved from the Hamilton School to the new school (to relieve crowded conditions). The school was built on Academy Hill, with the two schoolhouses on the site moved to the west side of the lot. 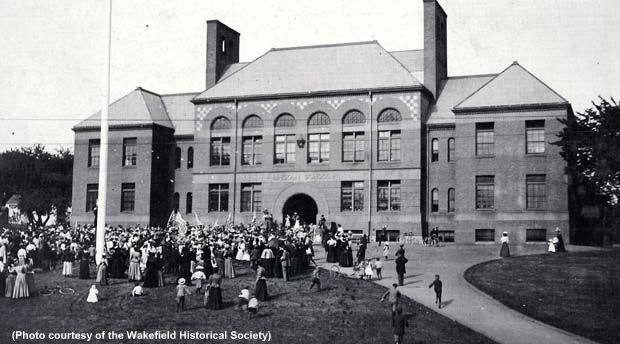 Town Meeting appropriated $50,000 in March 1891 and ground was broken in April. An additional $8,000 was approved in March 1892 for furnishings and to grade, fence, and improve the grounds and sidewalks. A vote was also taken at the meeting to name it the Lincoln School. When it opened, the school had 10 school rooms, two 'good' recitation rooms, a teachers' room and several minor rooms. It was noted that the building 'though plain, presents an imposing appearance, being well-proportioned and finely situated. It will be a credit to the town and to the architects, Messrs. Wait and Cutter.'" - Text from calendar by Jayne M. D'Donofrio. “Lincoln School circa 1910,” NOBLE Digital Heritage, accessed April 22, 2019, https://digitalheritage.noblenet.org/noble/items/show/7008.